NOTE: This is an archived post. Get the latest information on our Super Bowl Parking homepage. 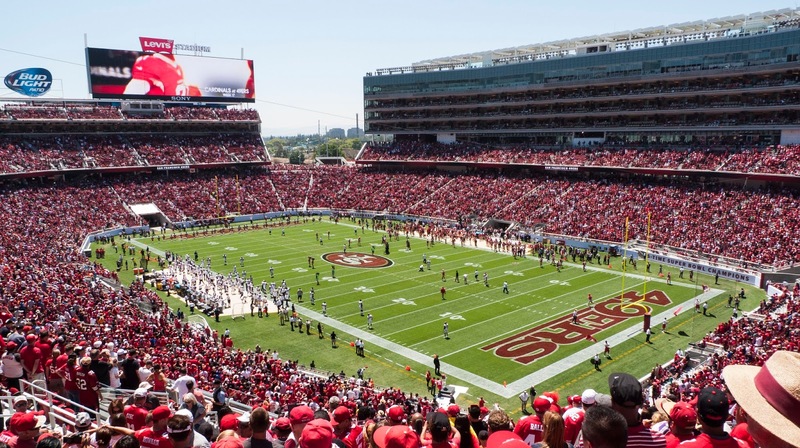 The 50th Super Bowl is scheduled for the afternoon of Feb. 7, 2016 in the gleaming, $1.2-billion Levi's Stadium, home of the San Francisco 49ers, in the City of Santa Clara. The duel between the Denver Broncos and the Carolina Panthers promises to be epic, even by Super Bowl standards. The stadium is adjacent to the Great America Theme Park and shares some parking facilities, so there are thousands of spaces in close proximity. The parking is divided into more than a dozen separate lots. Many of the spaces set aside for vendors, sponsors and VIPs, but a portion of the convenient parking will be made available to verified ticket holders. To secure a reserved NFL-sanctioned space at the stadium for game day, visit (no longer available - sorry) and search for "Super Bowl Parking Passes." Prices at last check ranged from about $60 for a vehicle to $300 for a limo. Please see below reserved Super Bowl parking options including park-and-ride. As for prior Super Bowls, no tailgating will be allowed at NFL-sanctioned lots. The lots will open at 9 a.m. and close two hours following the game's end. And remember to wear comfortable shoes: No shuttles will be provided from your parking space to the stadium. Another option for visitors for the Big Game: Hop on the Super Bowl Fan Express Bus, offered by the Super Bowl Host Committee. The bus shuttles run between nearby hotels and Levi's Stadium on game day. The owner of a nearby property is making spaces available for RVs and tailgating including overnight parking, neither of which is allowed in NFL-sanctioned lots. Please email indytimes@gmail.com with your name, contact number and the dimensions of your RV, and we'll pass along your information! 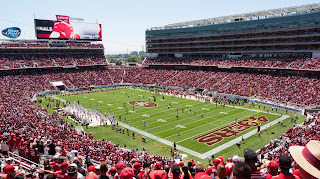 You don't have to venture to Levi's Stadium to experience the hoopla surrounding the Big Game. The ever-popular NFL Experience will take place over several days leading up to Super Bowl Sunday at the Moscone Center in San Francisco. Tickets are much more affordable, too, at $35 for adults and $25 for children. If you plan to attend NFL Experience, eliminate one big headache now and book your parking space in advance. Q: How do I find an RV parking space where I can tailgate? A: The NFL does not allow tailgating on any of its official lots, and most privately controlled lots have followed suit. But we have made contact with a nearby property owner who has spaces available. Please email indytimes@gmail.com if you'd like to get in touch and reserve a space. Q: How do I arrange for a disability parking pass? A: Email superbowlada@gmail.com or call the NFL Mobility Hotline at 408-579-4610. Q: I'm not going to the game but would love to attend the NFL Experience. Where should I park? A: There are tons of good parking options, available for advanced reservation. Check out the available inventory here. Any other questions? Email us at indytimes@gmail.com, and we'll update here. We'll be updating this page constantly until the Big Game. Last update Feb. 7, 2016.